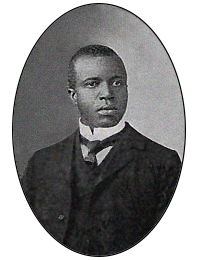 Scott Joplin in Juin 1903. This pictur an aa appears on the cover o "The Cascades" from 1904. Scott Joplin (/ˈdʒɒplɪn/; c. 1867/68 or November 24, 1868– Apryile 1, 1917) wis an African-American componer an pianist. Joplin achieved fame for his ragtime composeetions an wis dubbed the "Keeng o Ragtime". In his brief career, he wrote 44 oreeginal ragtime pieces, ane ragtime ballet, an twa operas. Ane o his first, an maist popular pieces, the "Maple Leaf Rag", becam ragtime's first an maist influential hit, an haes been recognised as the aircheteepal rag. ↑ Joplin, Scott (1899). Maple Leaf Rag (2nd edition) (sheet music cover). John Stark. p. 1.